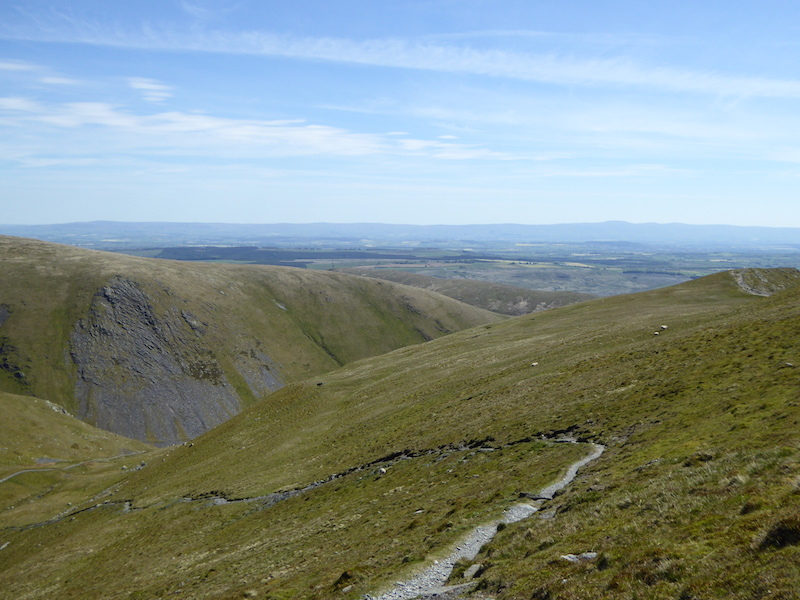 Another good weather day so we set off from Scales up to Blencathra. 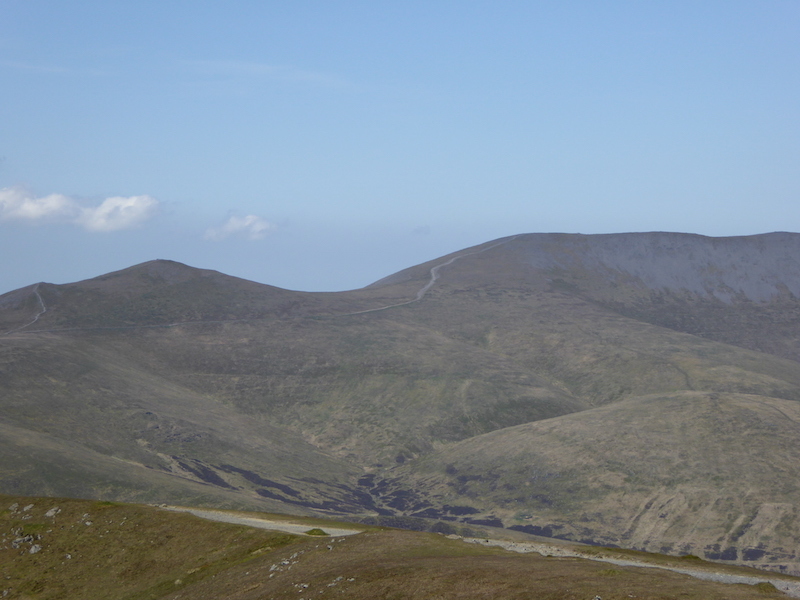 Across from us is Clough Head taken from the path out of Scales. 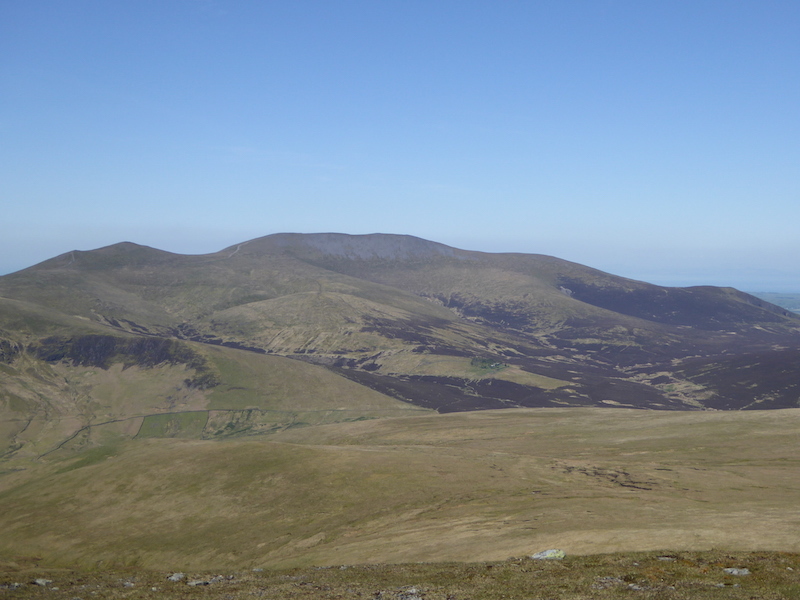 Its rather warm for steep walking, so a pause to mop the brow gives me a chance to take this view. We’re now high over Mousethwaite Combe and below us is the path we’ll be using to return to Scales. 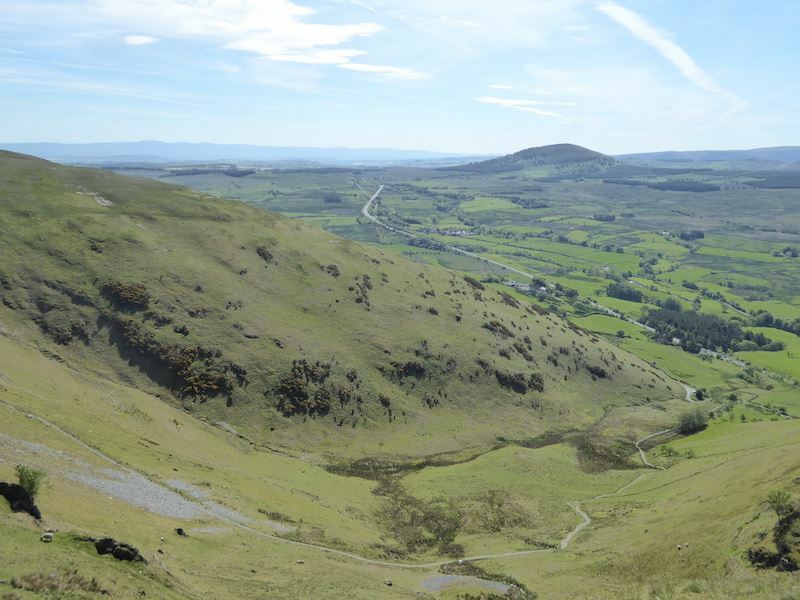 A little higher up gives this view of the bottom of Mousethwaite Combe and Great Mell Fell over on the right, with the A66 cutting between them. 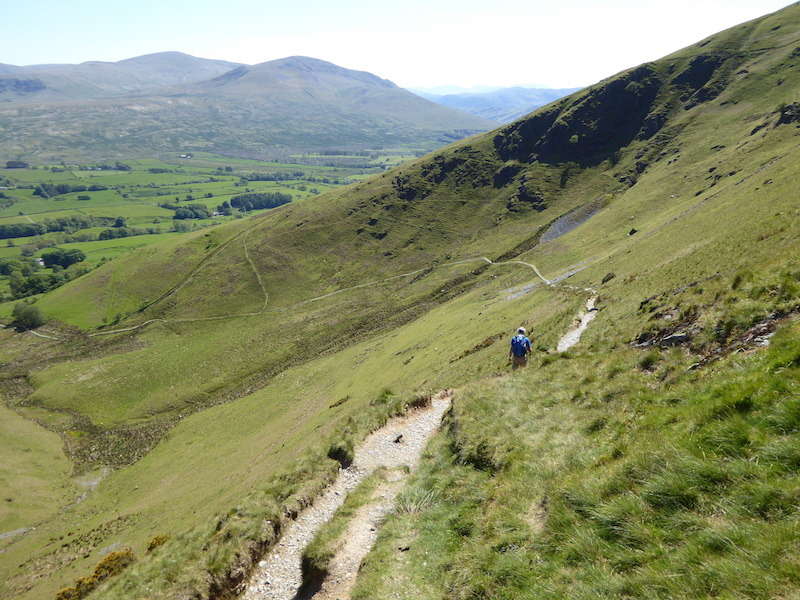 The path turns alongside Scales Fell and we have a stretch of level walking to enjoy. 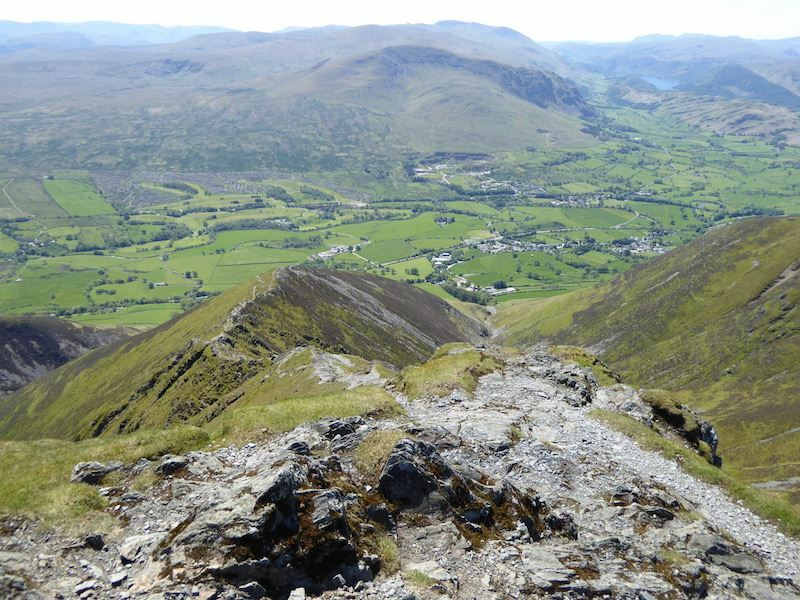 This route provides a good view of Sharp Edge at the eastern end of Blencathra. 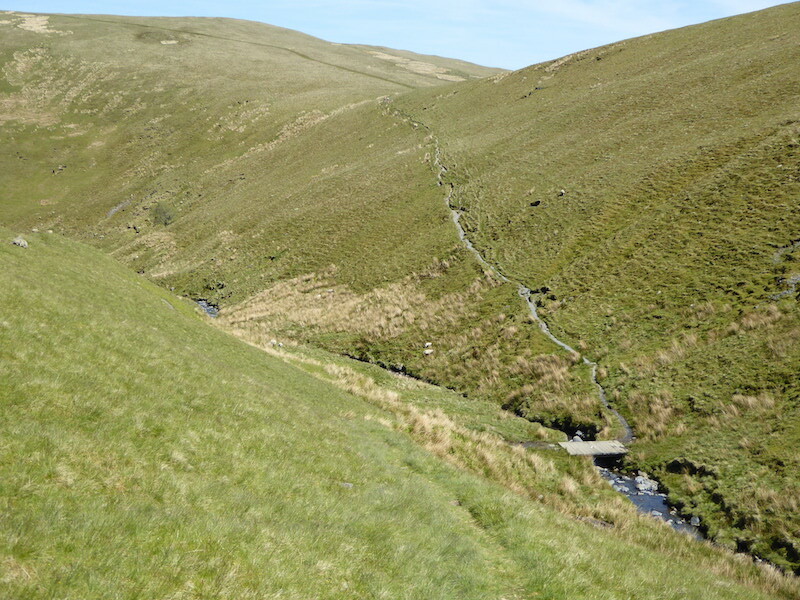 On the other side of the beck is the path we’ll be using on our return leg. 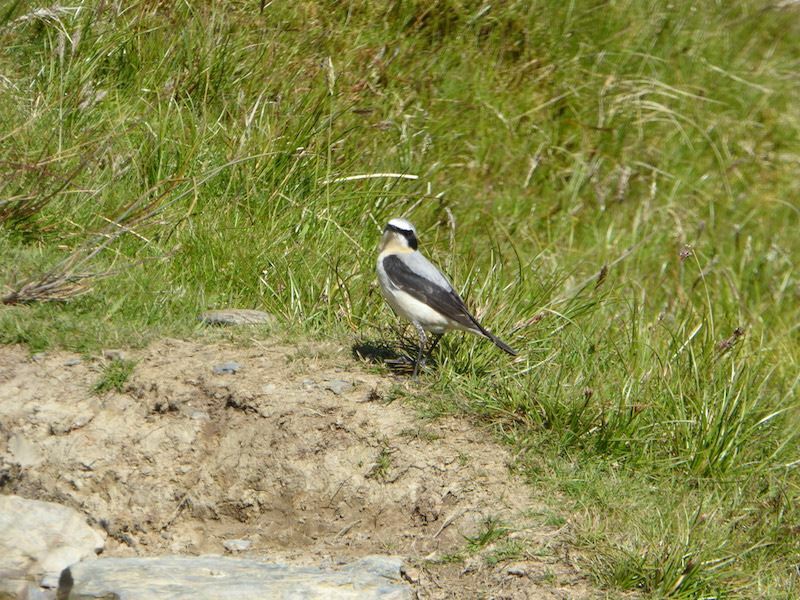 A male wheatear, who didn’t seem too bothered by our presence. 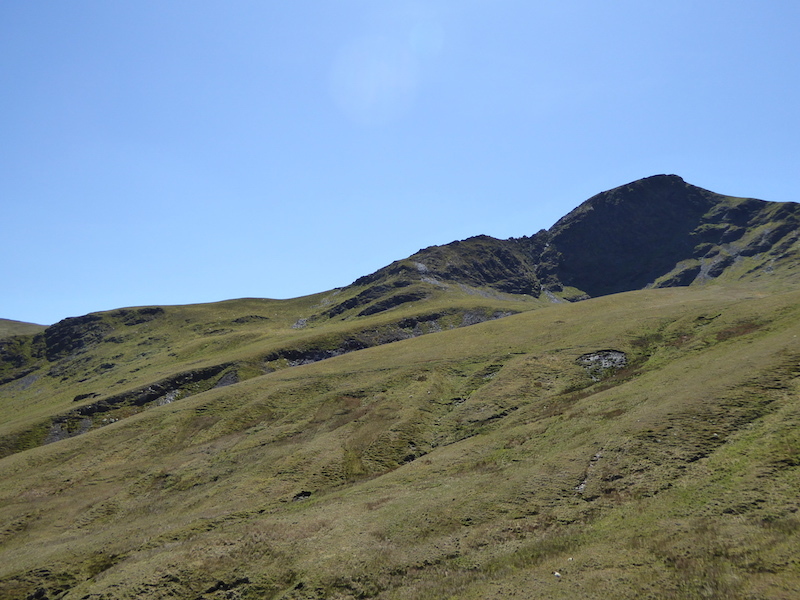 From the level path we turn up alongside Scales beck and start the climb up to Scales Tarn. 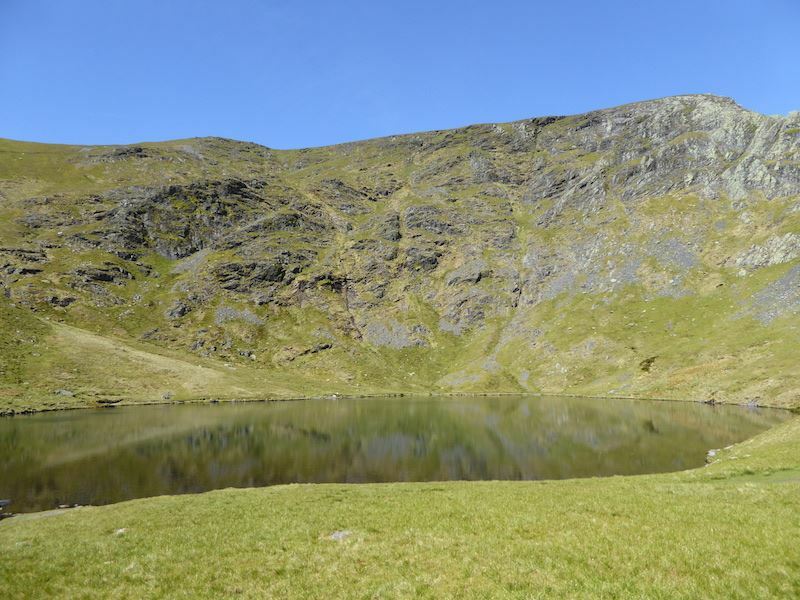 A short break at Scales Tarn and a good view of Sharp Edge. Several walkers made their way along while we were sitting here. 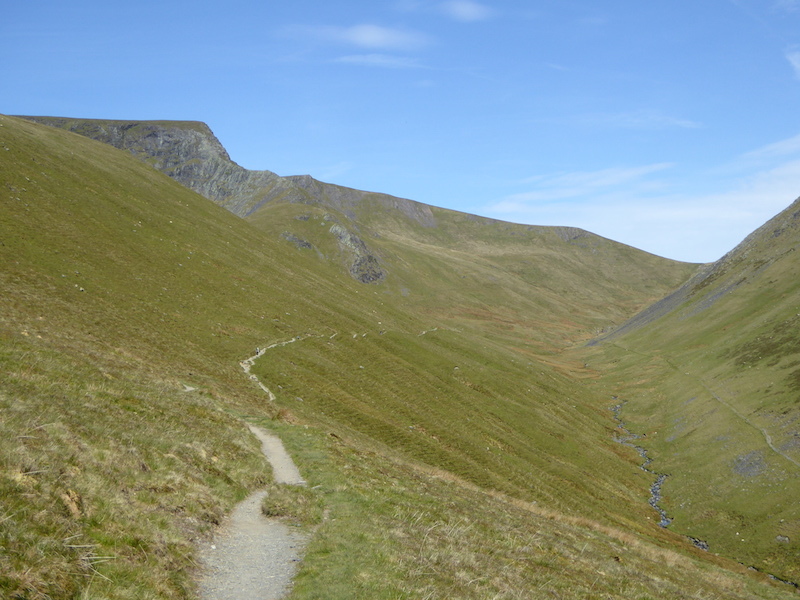 Scales Tarn and the path which leads on up to Blencathra. 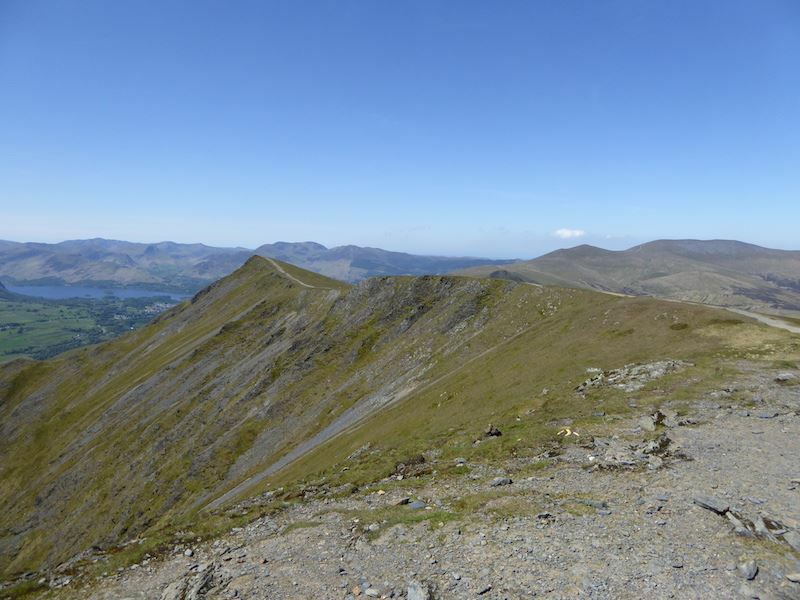 Its steeper than it looks and hobbling up with a calf muscle problem didn’t make it any easier either. 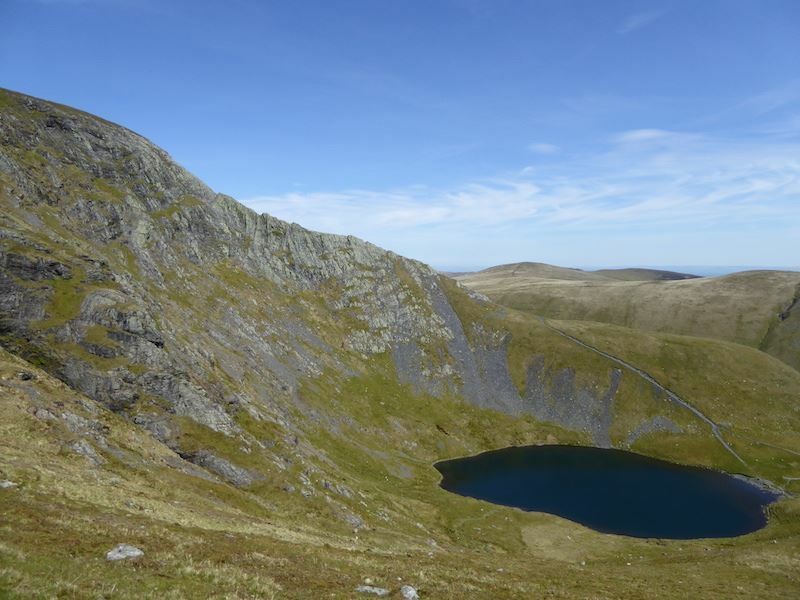 Sharp Edge above Scales Tarn, the delights of which will remain forever unknown to me, I’m not good at walking on exposed knife edges. These two chaps didn’t seem to have any such problem, or maybe they did as it took them quite a while to stop talking about it and actually make a start across. The lone walker out in front had passed us earlier and had set out just before the back two, already he is well ahead of them and striding out almost as if he’s on flat ground, so I would think he’s crossed over here before. 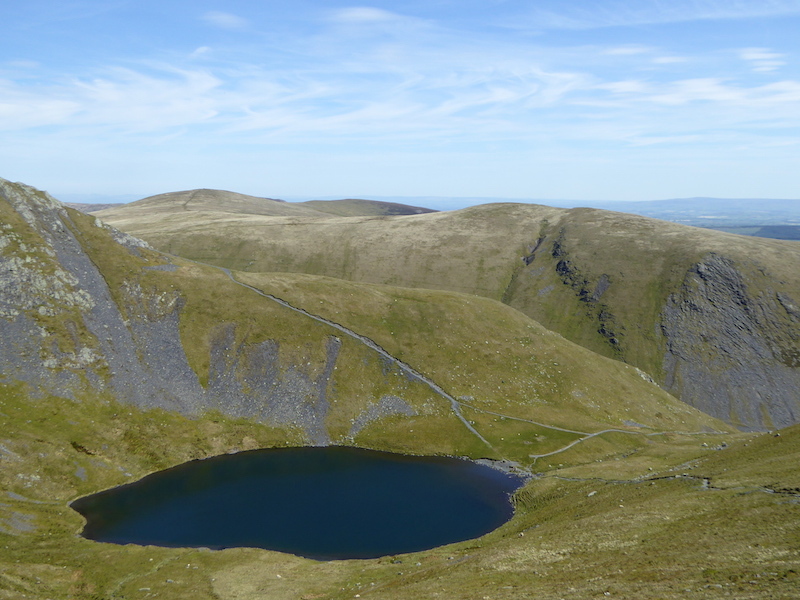 Sharp Edge and Scales Tarn below. 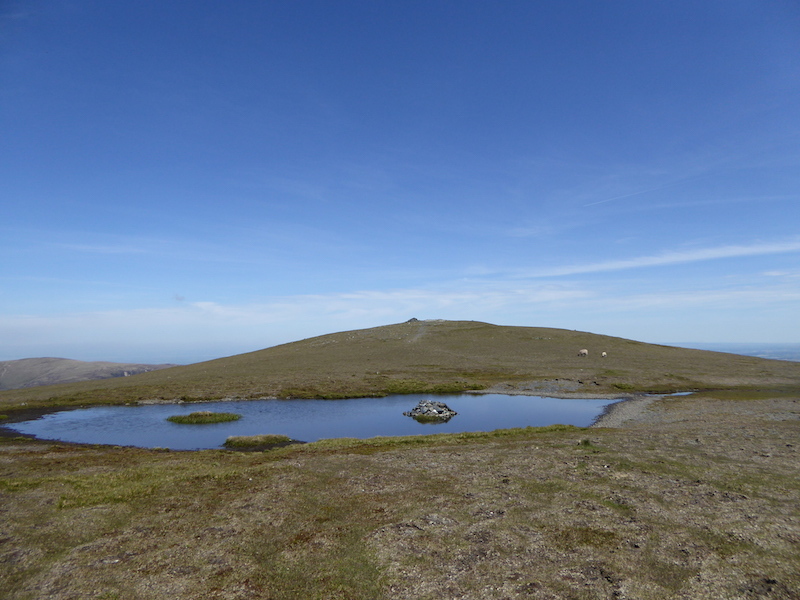 I had to gain a bit of height before I could get the whole tarn in the shot as its quite a big one. 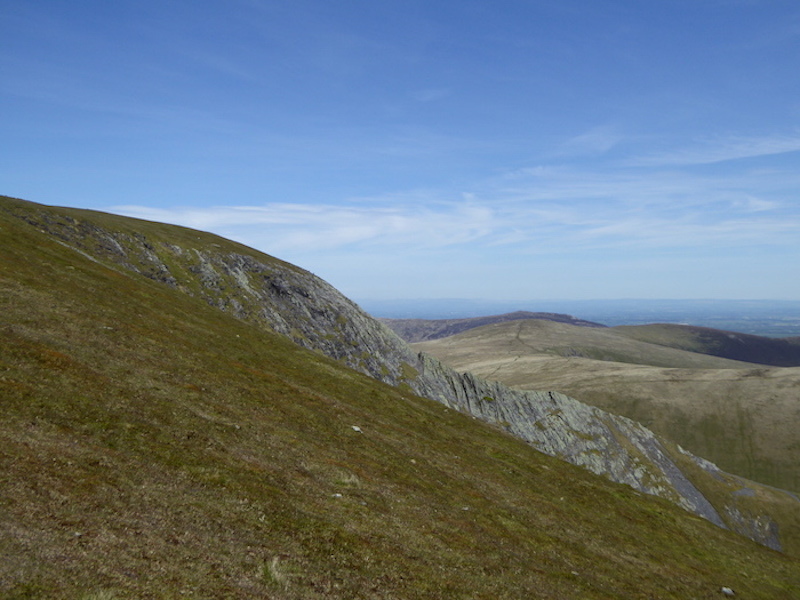 Beyond the Sharp Edge path the fell over to the left is Bowscale Fell, to its right is Carrock Fell, and then on the extreme right, with the craggy face, Bannerdale Crags. Stopping for a breather again on the way up the path we look east towards the northern end of the Pennines. 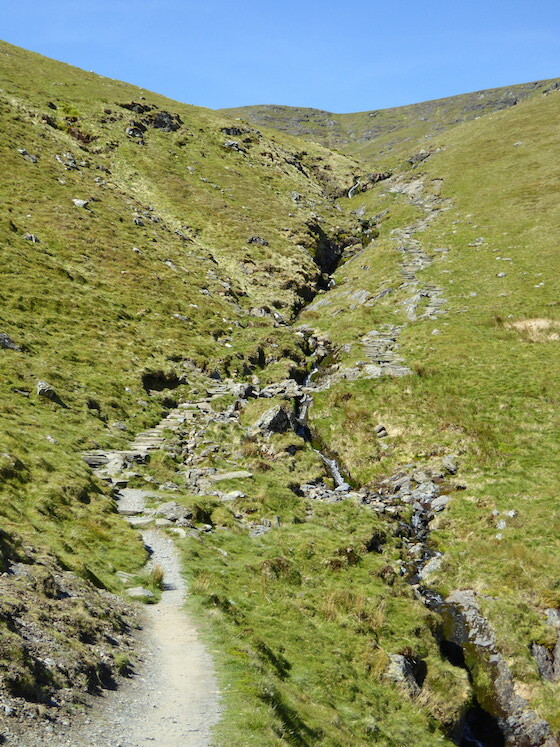 Did I mention earlier that this was a steepish sort of path? 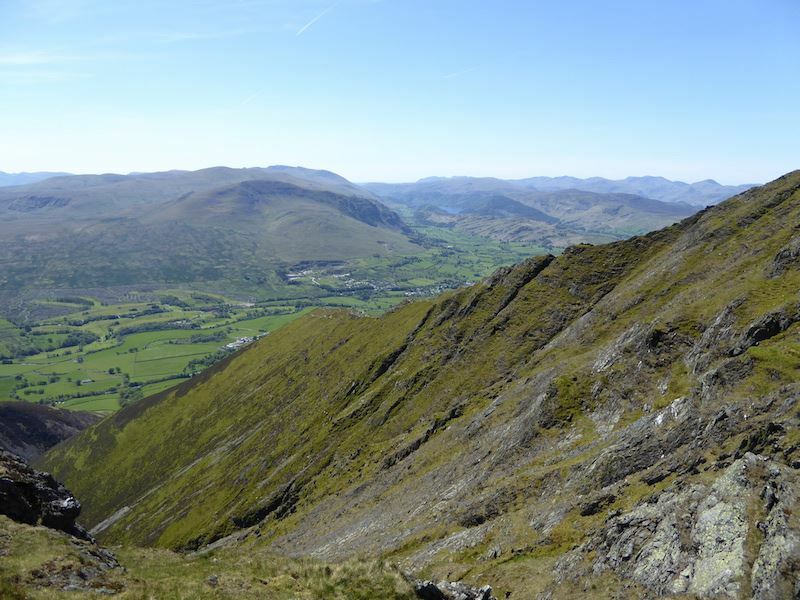 Looking southwards across the Halls Fell ridge on the final stage to the top of Blencathra. 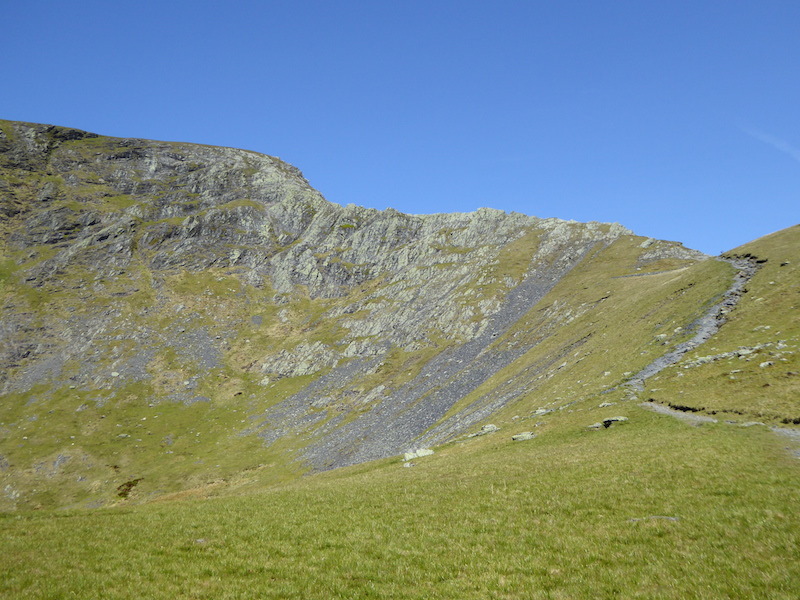 The upper part of Halls Fell ridge which ends conveniently right on the summit of Blencathra. Look closely and you’ll see some tiny figures on the top. 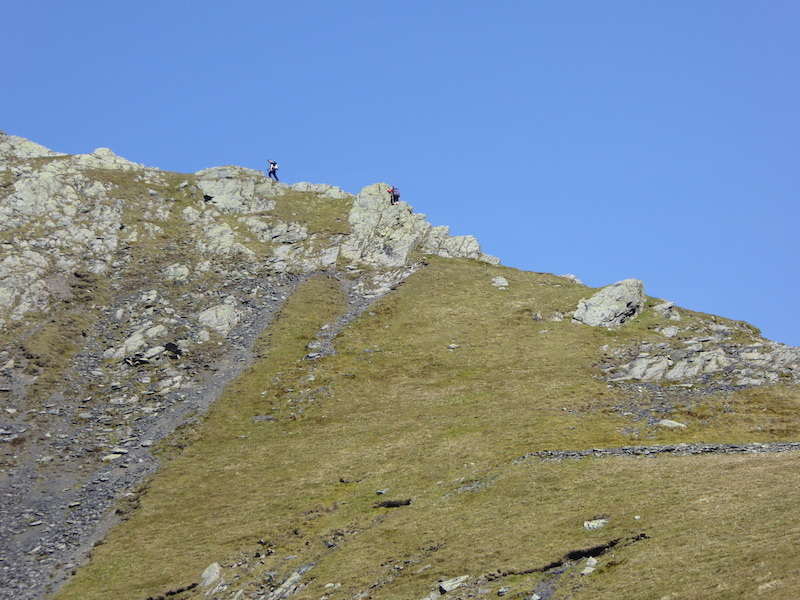 Sharp Edge was still attracting attention. A group of walkers were having a good look down at it. 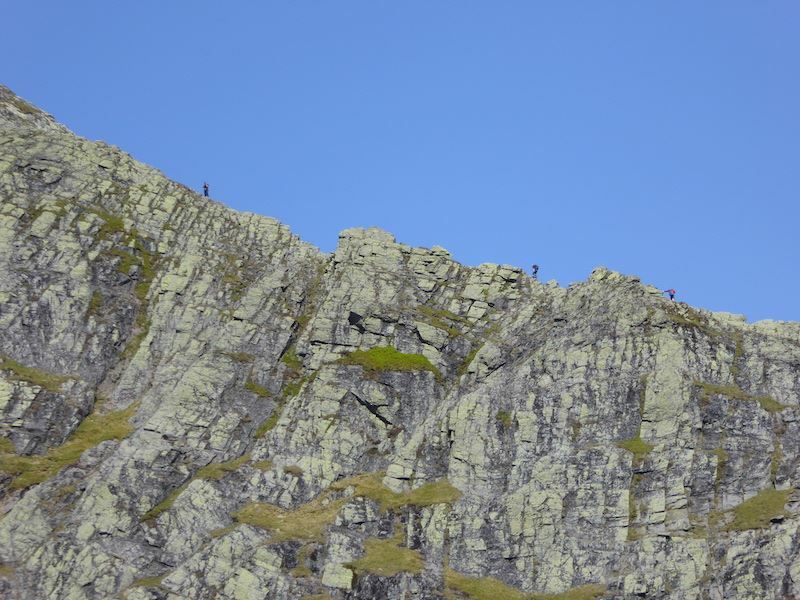 They looked to be just taking photos rather than making their way down it. 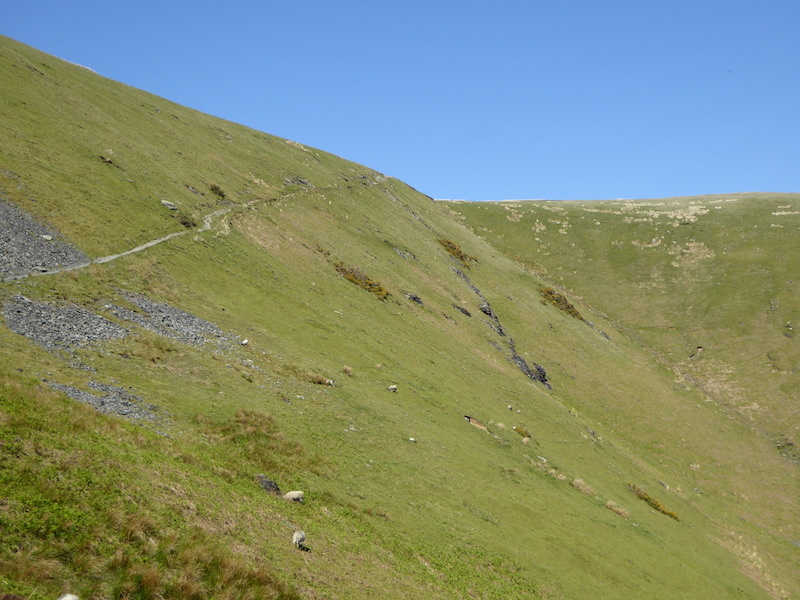 Looking down into Doddick Gill between Doddick Fell and Halls Fell. 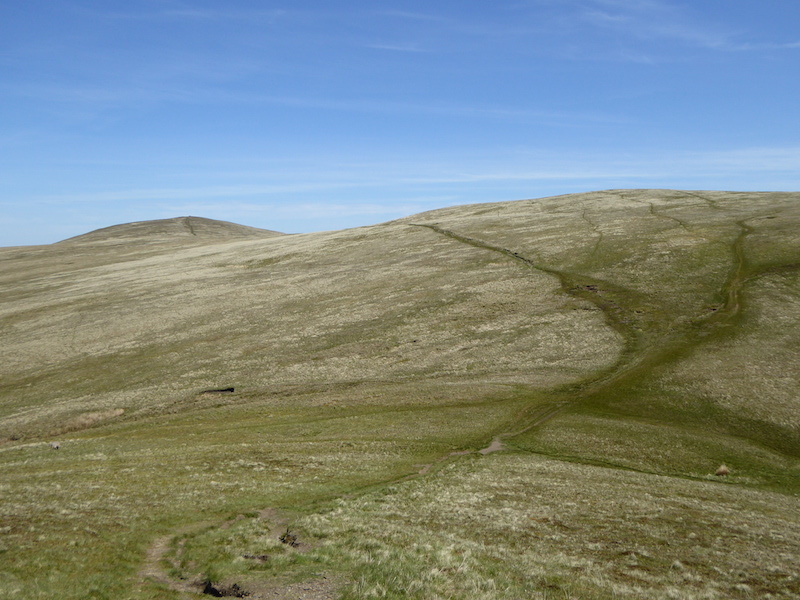 A look back at the path over Scales Fell which we joined from the path we took up from Scales Tarn. 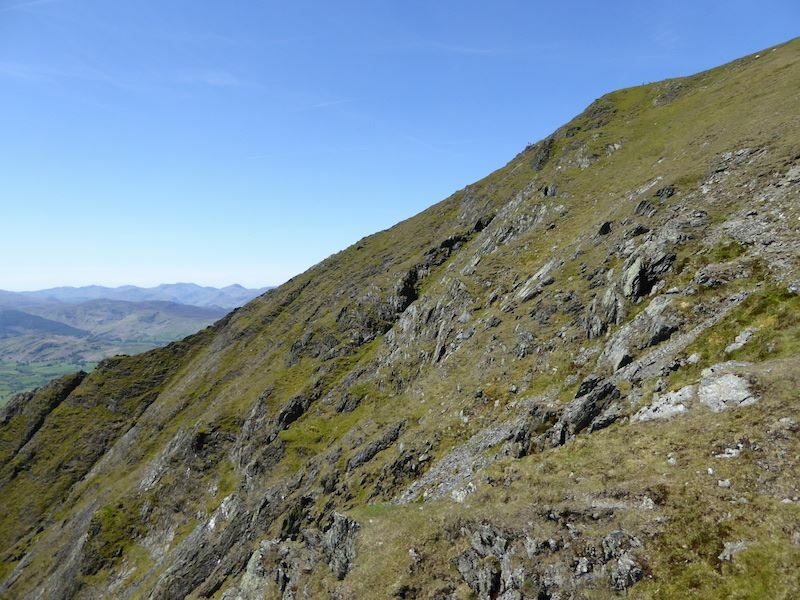 Another route up Blencathra, this one is the ridge over Gatesgill Fell. Derwentwater in the middle. 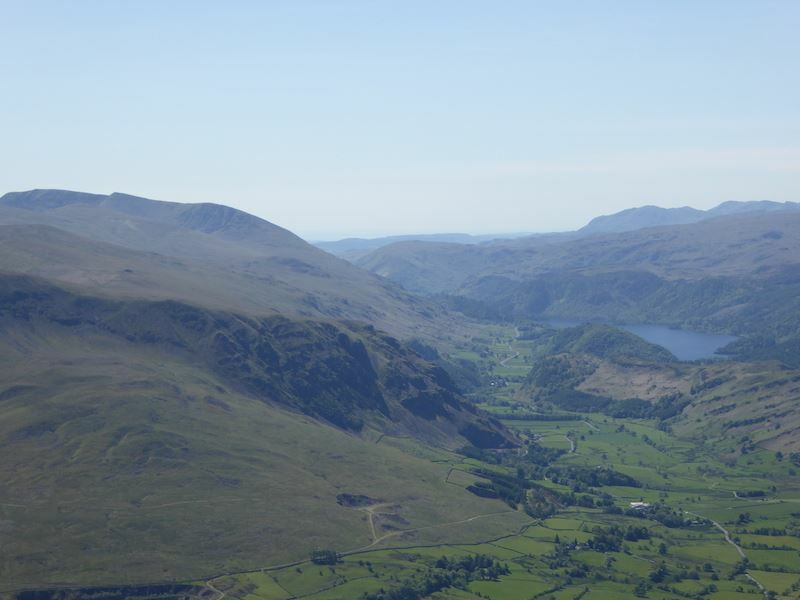 From Blencathra summit a rather hazy view of Thirlmere on the right and the Helvellyn range on the left. 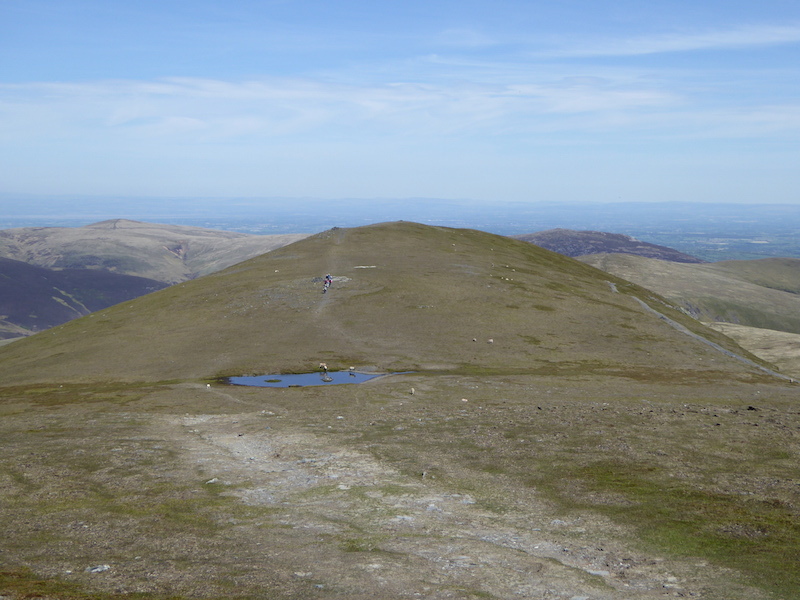 Behind us is Skiddaw Little Man on the left, rising to Skiddaw over on the right. 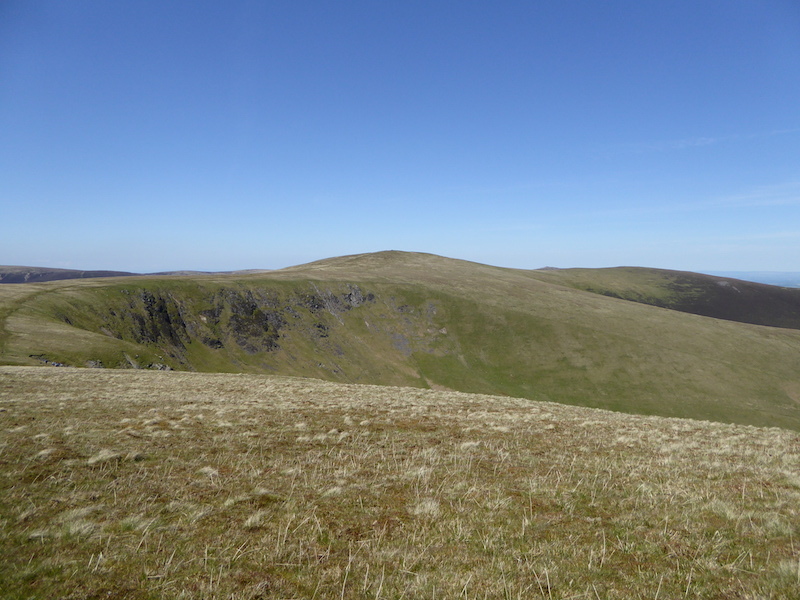 Looking over Mungrisedale Common, on the left is Great Calva and Knott on the right skyline. 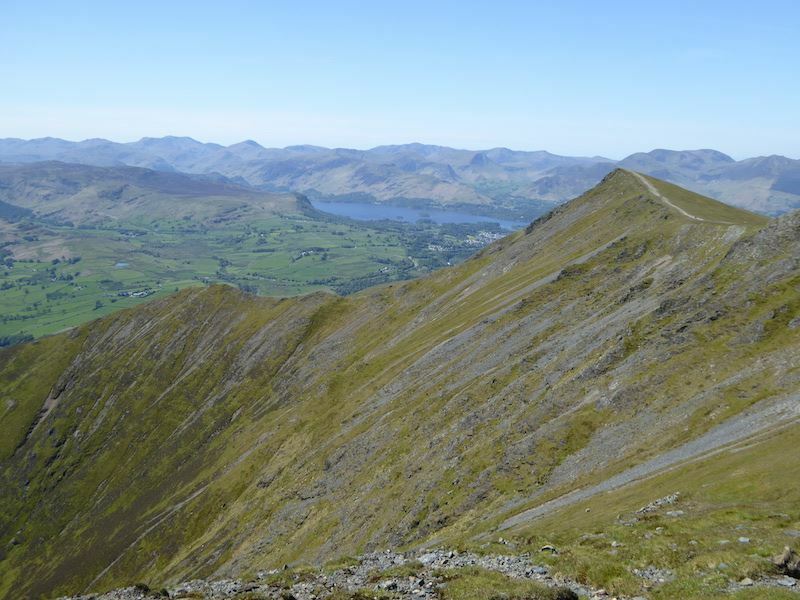 Blencathra summit at the point where the Halls Fell ridge path meets it. 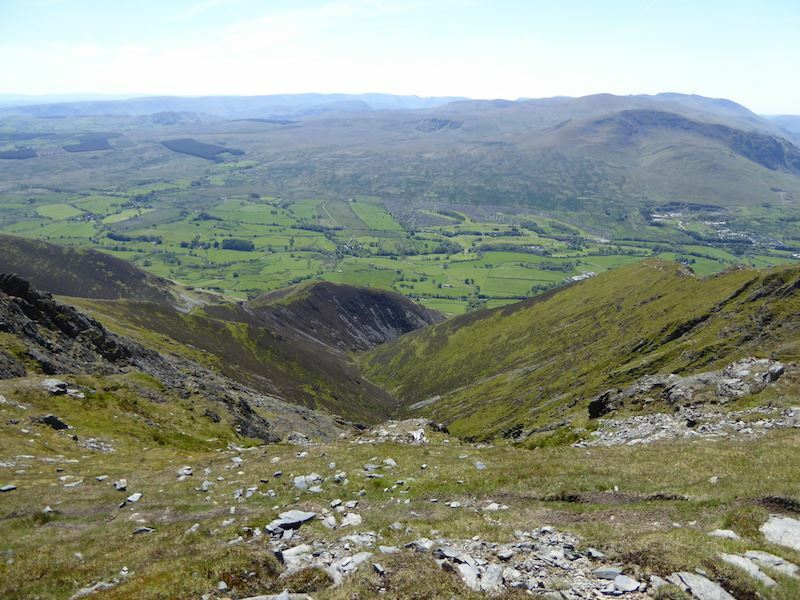 Looking south west along the ridge from Blencathra’s summit. 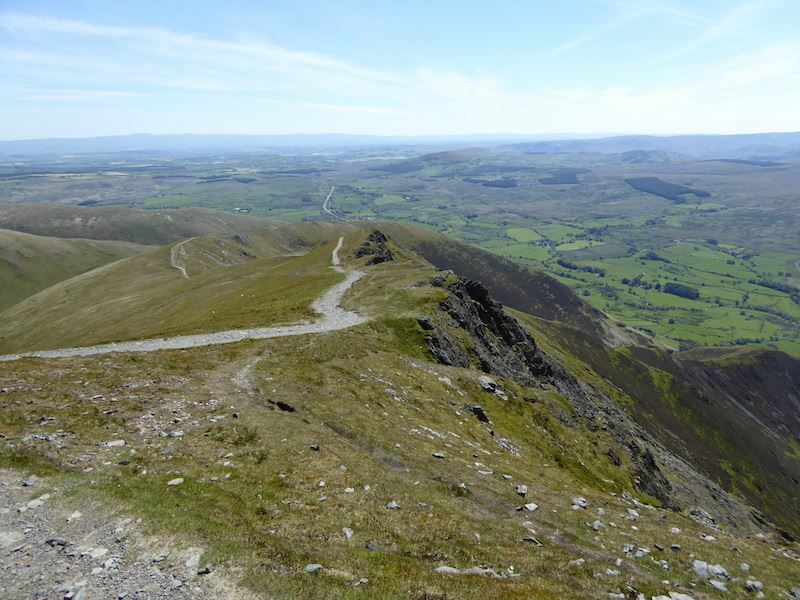 Proceeding in a northerly direction from Blencathra summit. 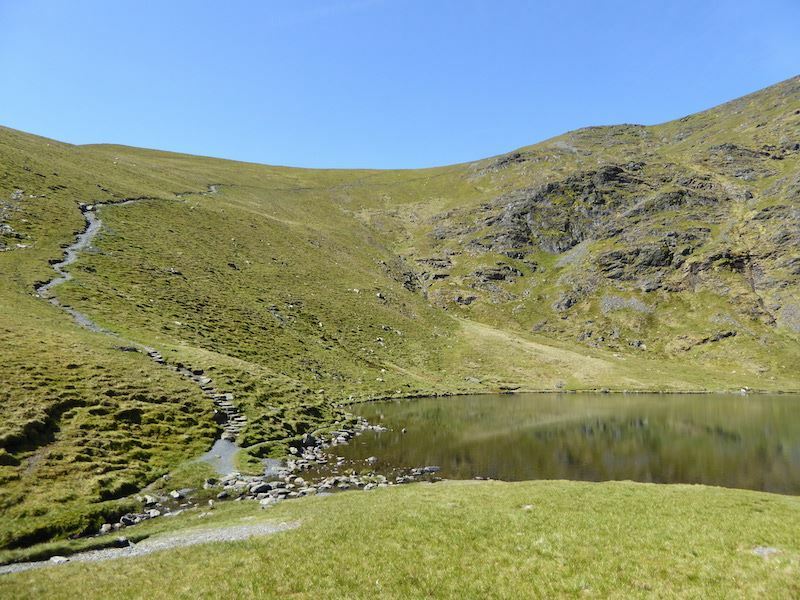 Blue skies reflected in the tarn along the way. 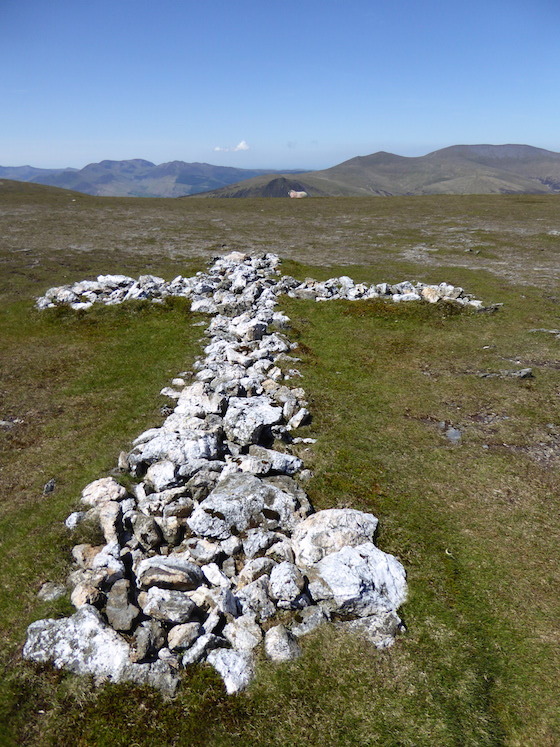 The white cross just a little further along from the tarn . A memorial created by the friend of a soldier who died in the first world war. 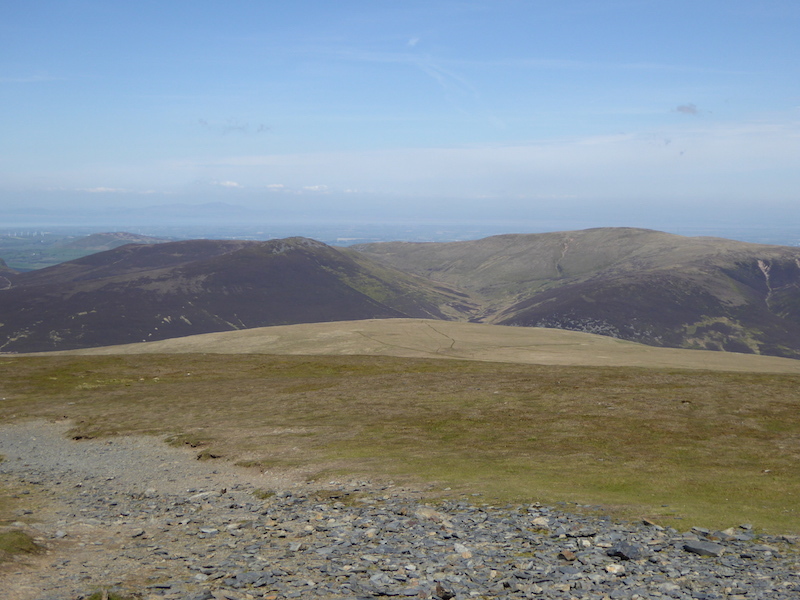 The Skiddaw massif from Blencathra. 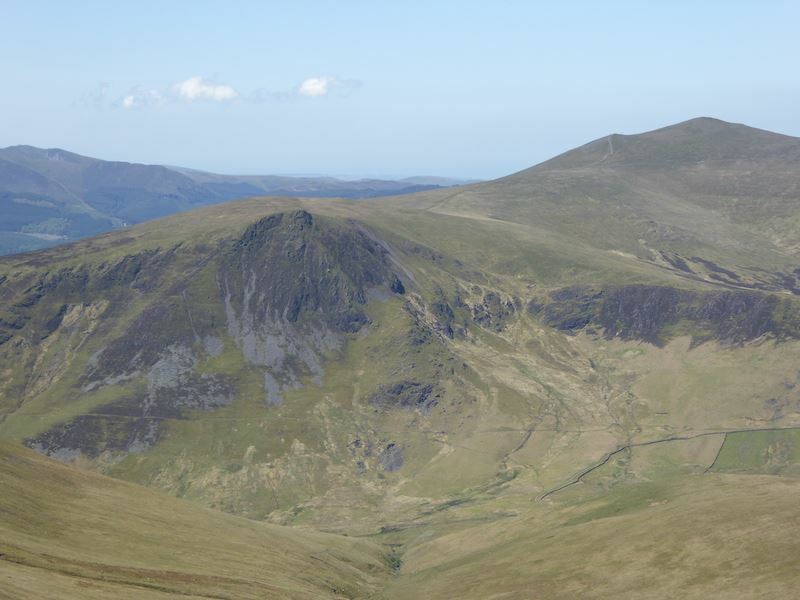 The craggy face of Lonscale Fell to the left of Skiddaw Little Man. 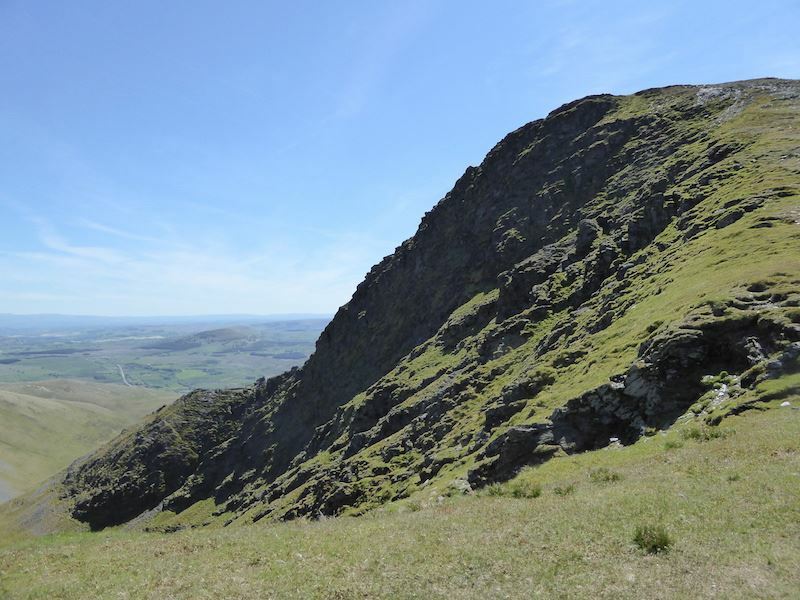 We’ve now dropped down from Blencathra’s plateau to here alongside Foule Crag, where there is a handy little shelter and where we stopped for a lunch break. 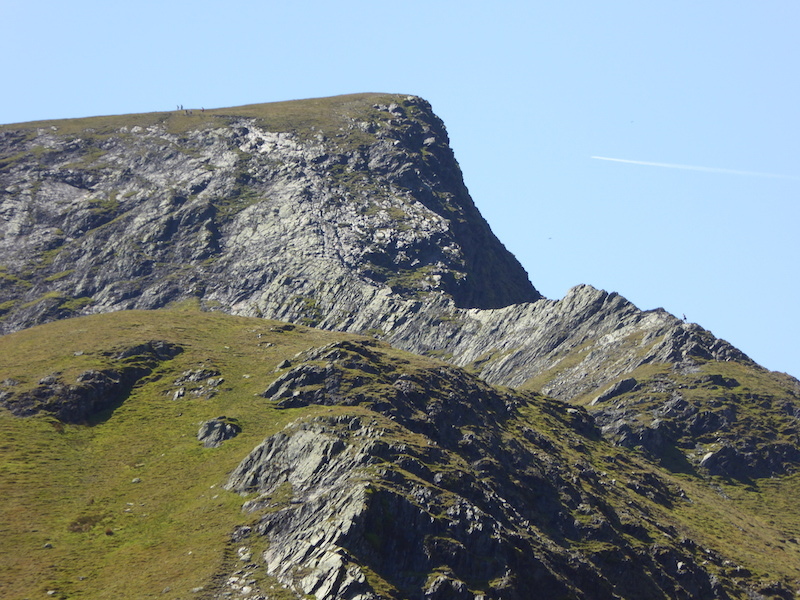 A view of Bannerdale Crags as we walked along from Foule Crag after lunch. Jacket on and hood up along here, it wasn’t half windy, blowing straight in from the east and cold with it despite the sunshine and blue skies. 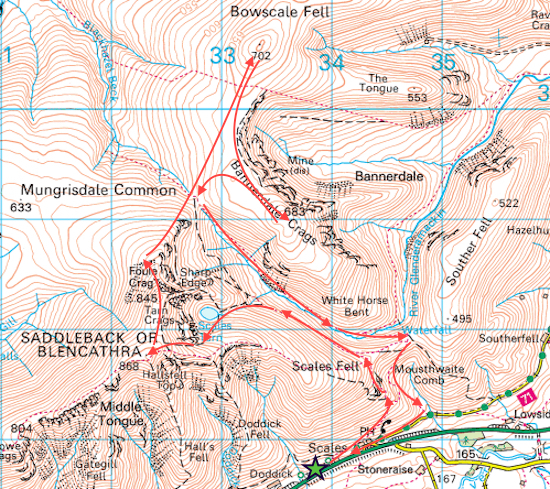 We’ll be taking the left hand path over to Bowscale Fell, the right hand one leads over to Bannerdale Crags. 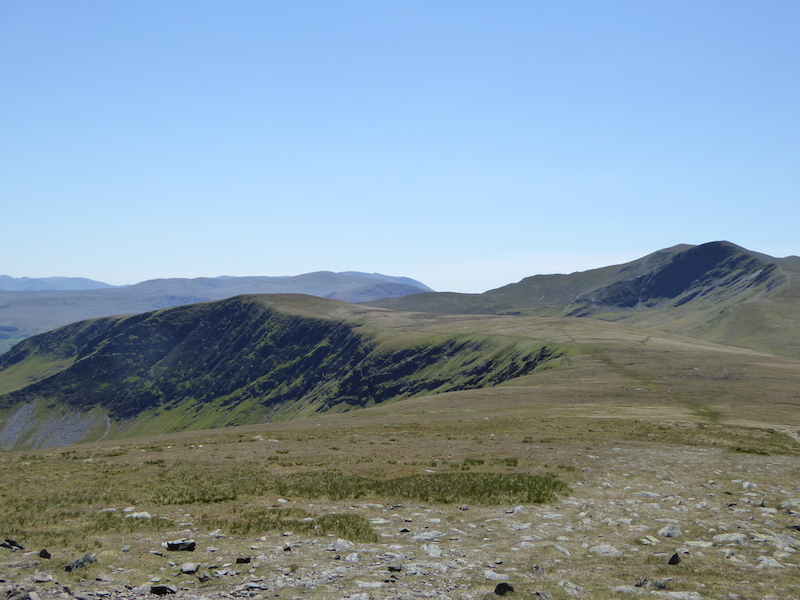 Bannerdale Crags on the left and Blencathra over on the right. Nice easy walking today as the squelchy bits were quite dry. 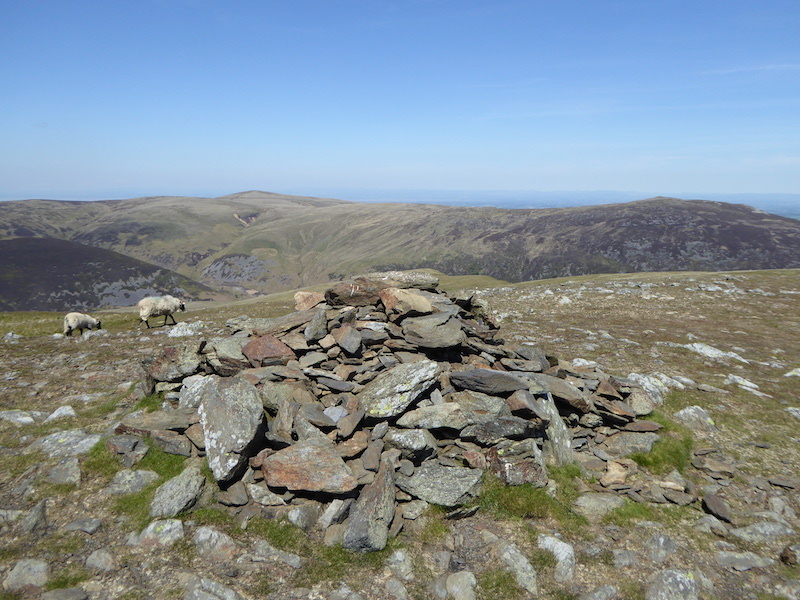 Beyond the cairn on Bowscale Fell are High Pike on the left and Carrock Fell on the right. 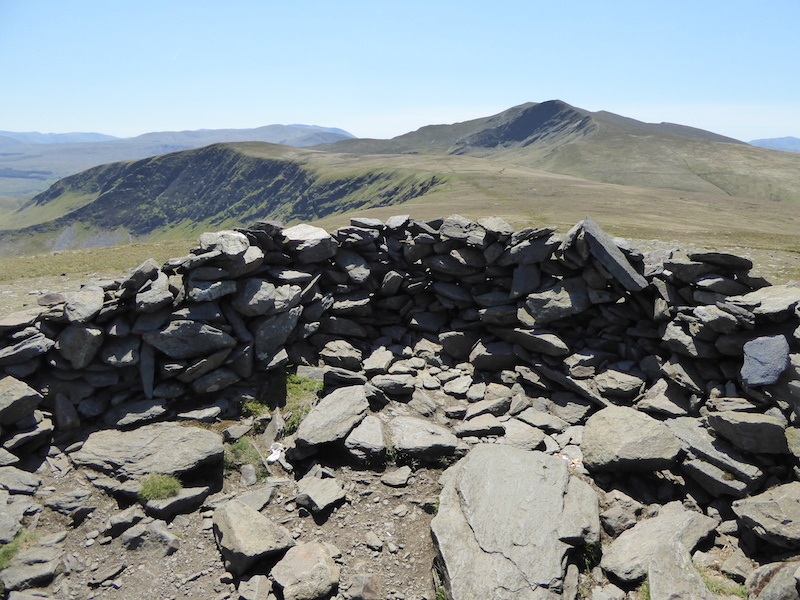 Bannerdale Crags and Blencathra from the shelter. 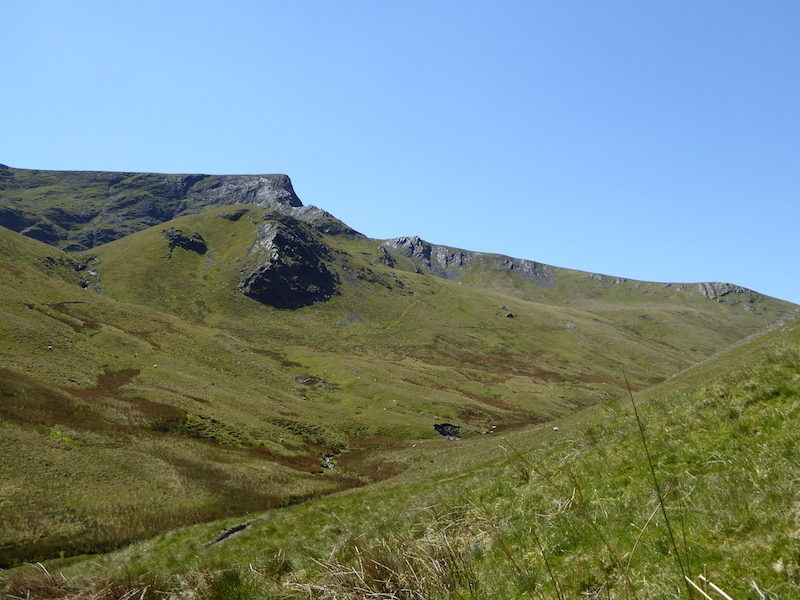 Now heading for Bannerdale Crags, the last fell of the day. 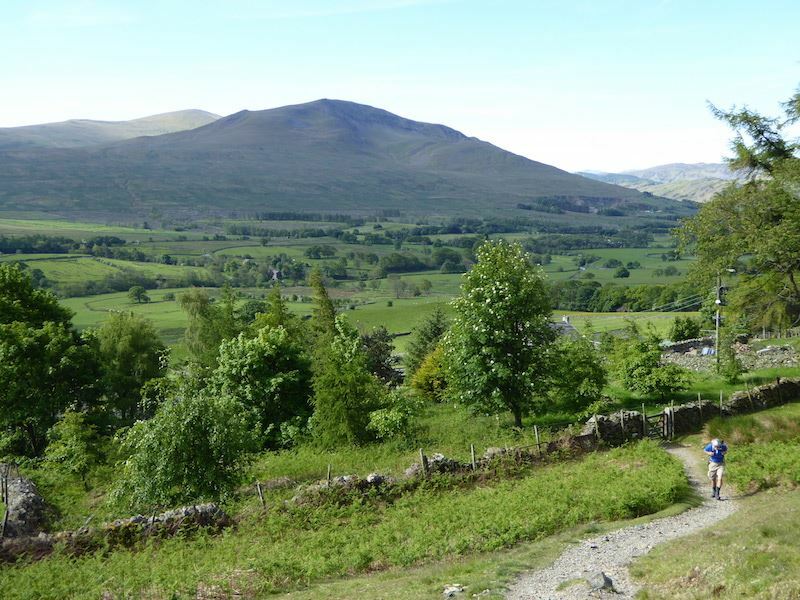 Looking back at Bowscale Fell. 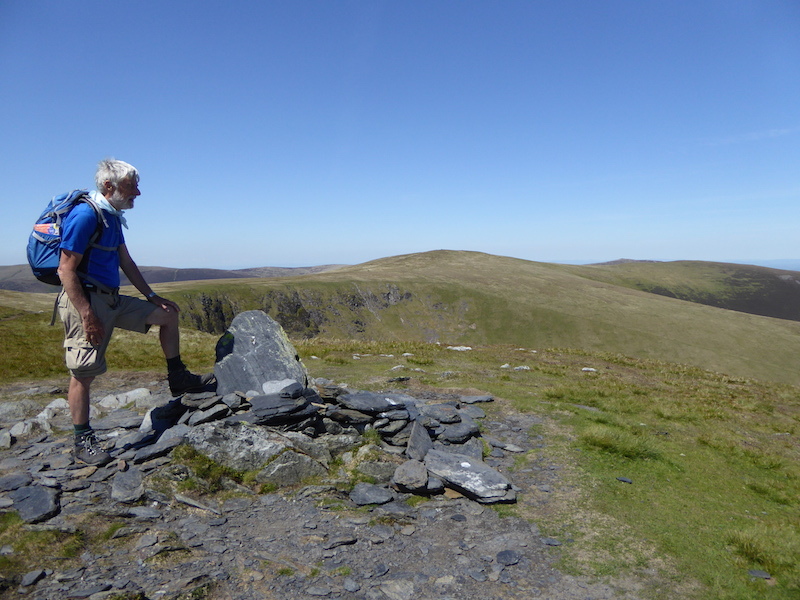 At the cairn on Bannerdale Crags. Not the highest point but that only has a single stone marker which isn’t all that interesting. 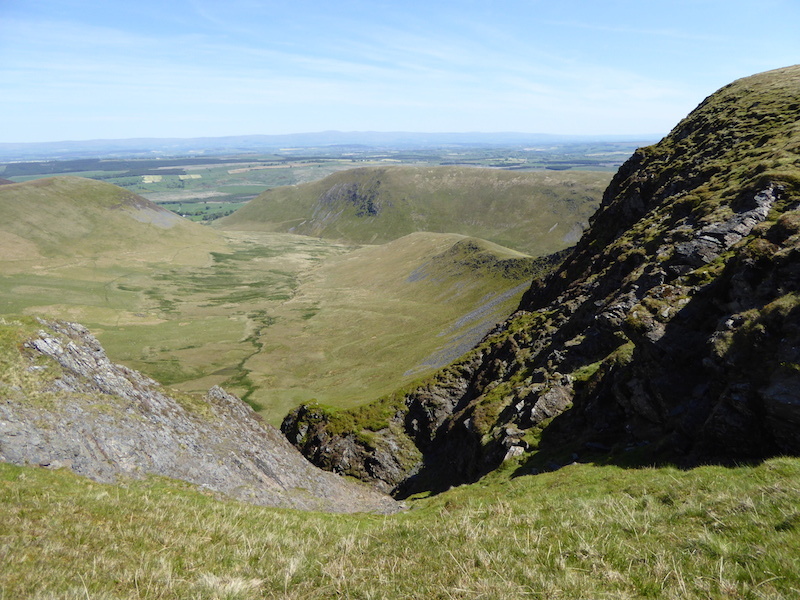 Looking over at Sharp Edge as we descend alongside Blackhazel Beck. 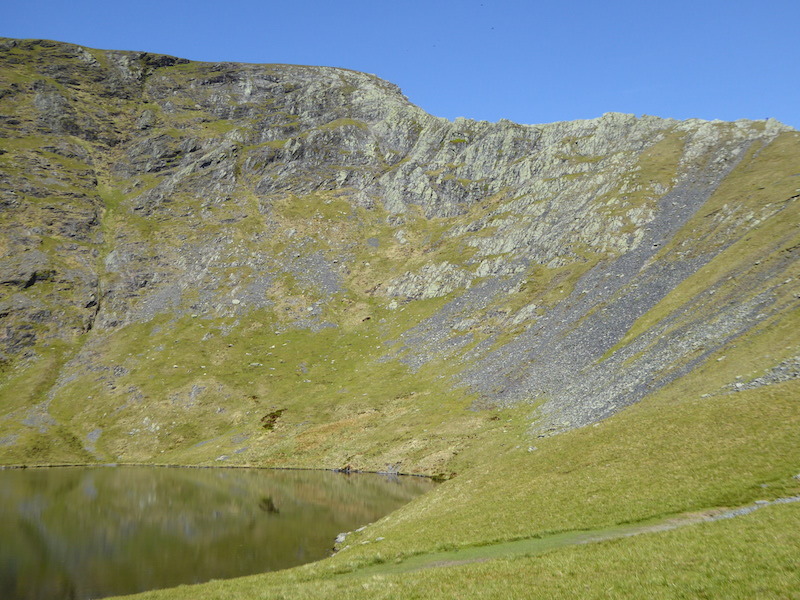 Well into the afternoon and Sharp Edge is still attracting walkers. 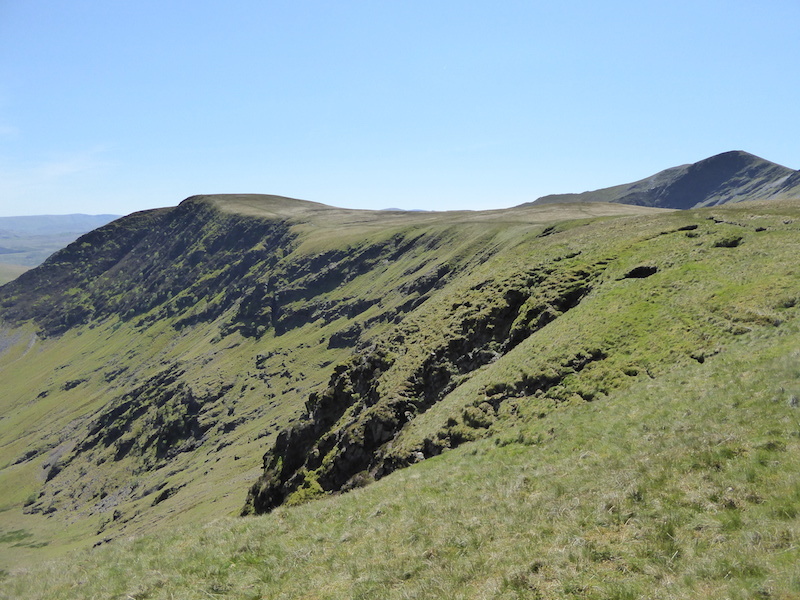 Well down the valley now and a look back at Sharp Edge and the ridge we walked along over to Bowscale Fell. Here’s where we leave the path on this side to join the one on the other side. 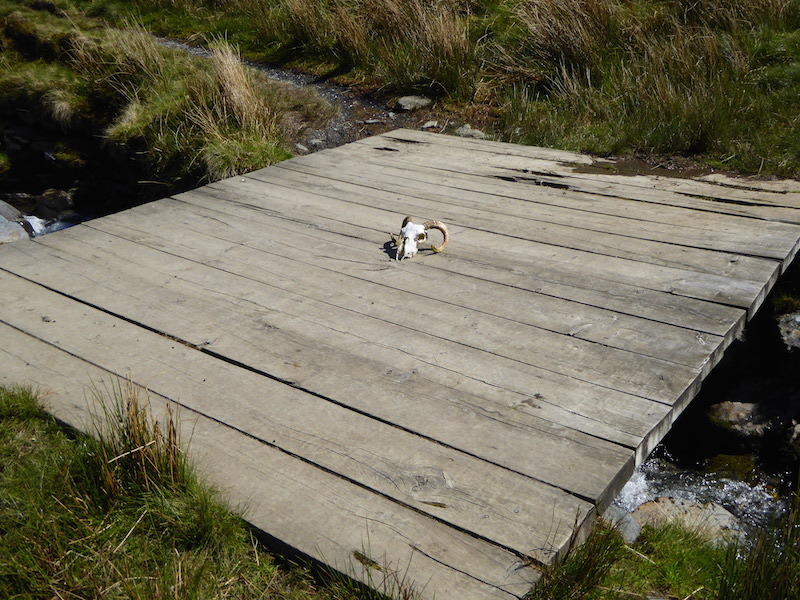 Down at the bridge ….. Being super brave and fearless we crossed over anyway. 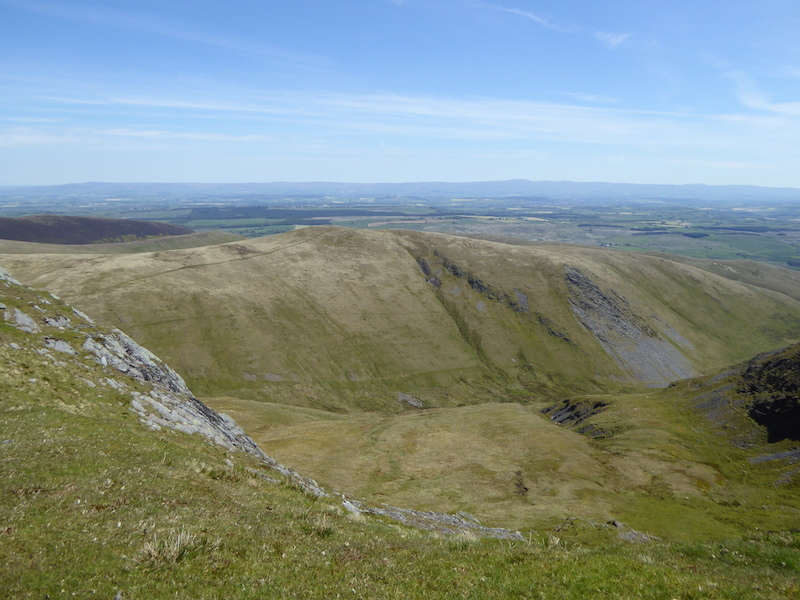 From the col by Souther Fell we took the path down Mousethwaite Combe. 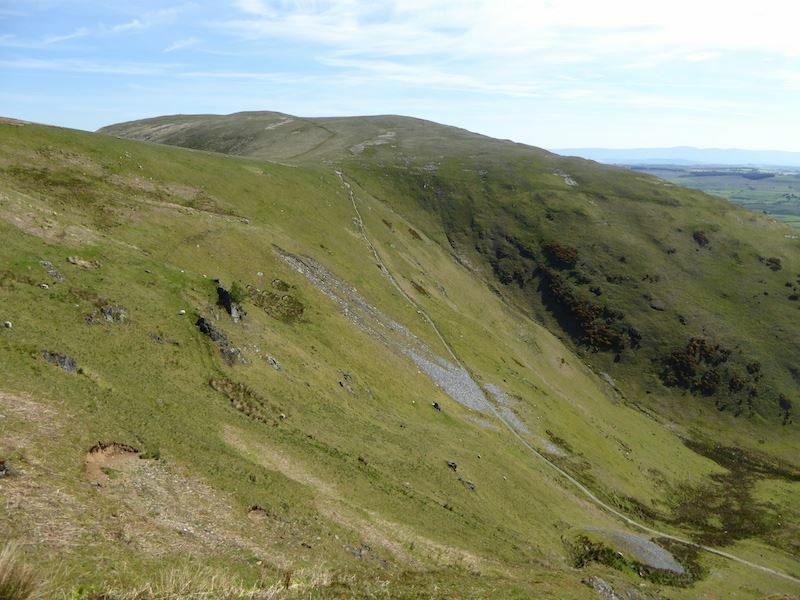 In the very top right hand corner is the path we were on earlier when I took the photos looking down into the Combe, although you might have to zoom in to see it clearly. A look back up at the path we’ve just walked down. 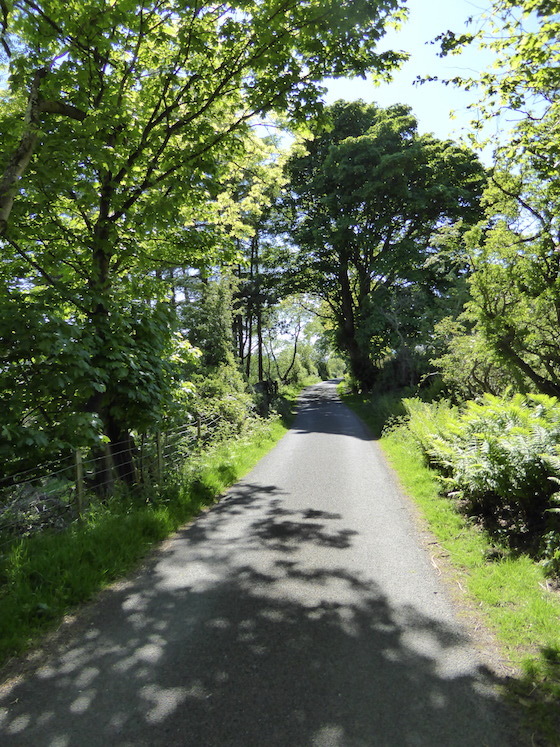 The lane back to Scales provided a pleasant flat walk and some very welcome shade, it was very hot down here with no wind at all.